Being dumped was the best thing that ever happened to me. I was seeing an Australian girl for a while when I lived in Galway, Ireland. One day she called me to tell me we needed to talk. That’s never a good sign. We met up at her place after I got off work. She sat me down and nervously got to the point. She wanted to break up. I knew she wanted to break up when she said we needed to talk. It was either that or she was pregnant. Thank god it was the former. What I didn’t know was I would meet my future wife as a result. The reality was I knew we weren’t soul mates. She was from Australia and I was from Canada. We weren’t going to leave Ireland together. All good things come to an end, I understood that. Instead of dwelling on the end of our short relationship, I suggested we should celebrate it. I smiled, accepted my fate and invited her out to dinner — on a breakup date. Naturally, she was hesitant to go for dinner with me, since she literally just broke up with me. She agreed to the date once she was convinced that I had accepted her wish to terminate the relationship. The Home Plate was this cute little restaurant in Galway. The food was delicious and affordable for backpackers and locals on a budget. It was perfect for people like me. I think the cozy place had about ten tables at the most. What can I get y'all? My ex-girlfriend and I were seated together at a two-seater near the kitchen. We were talking about mutual friends and local gossip when our waitress approached, “What can I get y’all?” I found her attractive and thought her American southern accent was odd to hear in a tiny restaurant on the west coast of Ireland. Dinner was a bit of a blur. I probably had the chimichanga or the chicken curry, both were my favorite dishes on the menu. After we ate, I hugged my former girlfriend and bid her farewell. Rather than heading back to my lonely flat, I went to the pub, which was conveniently located below my lonely flat. The evening festivities were as fun as always. I mingled with local friends and fellow backpacker chums over many pints of Guinness. The early evening became later that night, and low and behold, that cute waitress entered the pub! I approached her (with liquid courage) and exclaimed that she was my waitress earlier that night. She affirmed my statement. I then explained that I had been on a breakup date. In fact, I was now a “free man”. As you would expect, she was not impressed by the statement. I believe she replied with something polite like, “that’s good for you”. We didn’t talk much more that night. We both left with our respective friends and that was that — for the time being. I had no idea she would become my wife and mother of our children. When you are a foreign backpacker, working at a hostel, living in a city with 60,000 people, you end up mixing with the same people often. I ran into her several times after the first chance encounter. We chatted and started to get to know one another a little more each time we ran into each other — usually in a pub. One day, weeks later, I was finishing my shift working at the hostel. I was sleep deprived and dealing with a hangover. I was ready to pull myself away from the reception desk, down the stairs, up the street, into my flat, and under my blankets to crash for the night. I was cashing out when the beautiful, blonde waitress from Tennessee entered to my surprise. Suddenly I felt one-hundred percent again. My foggy fatigue was instantly converted to positive energy. It was a miracle, Heather had cured my hangover! We left the hostel together and spent the evening laughing, talking, and listening to the finest Irish traditional music in the world at The Crane pub. Our first date of many over the next seventeen years (and counting). A breakup could have been the worst thing ever. Instead, it was the best thing that ever happened to me. As painful as they can be, breakups happen for a reason. I fondly recall Ireland every time I'm out in a misty rain, or listening to Planxty, or sipping a creamy pint of Guinness. I have many reasons to long for Ireland. 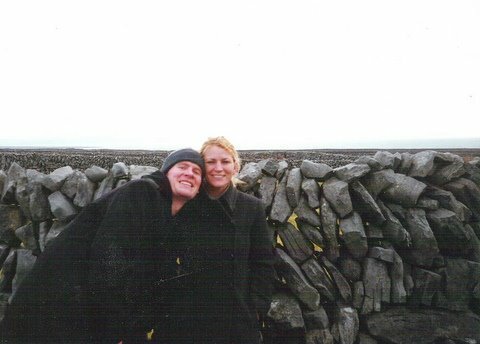 Galway is where I met my best friend and wife, Heather. I miss sitting in Neachtains on a cool, Saturday afternoon with Heather, playing cards by the peat fire. I miss taking seaside strolls along the Salt Hill promenade during the warm days. I loved Thursday nights, upstairs at The Crane. We would sit, listening to the finest Irish traditional music in the world. It's also where Heather and I had our first date. There's much I miss about Galway and of my adventures hitchhiking across the country. The truth though is that I miss the feelings of the time, I'm a sucker for nostalgia. Ireland was carefree freedom. Before meeting Heather, I didn't even care for myself. She taught me how. She gave me a reason to. That's the part I don't think about enough. We choose our memories to dwell on. I don't consider the loneliness, the hangovers, the poverty, and the dreadful weather. I do miss Ireland, but I know it's the freedom that I miss most. I'm a husband, father and consultant, I can't run away to find the freedom again. Instead, I need to realize the freedom still exists. I work for myself, I make my own hours. And on a rainy day like when I wrote this, when the nostalgia has kicked back in, I'm free to slip away to my local pub for a pint of the black stuff. Savor your recollections, but don't let your selective memory fool you. It was never all roses (or four-leaf clovers). Take a deep breathe and be thankful for what you have.